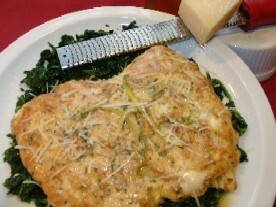 Chicken Francese - A buttery, lemon-wine sauce complements lightly battered, melt-in-your-mouth chicken. You love it at your favorite restaurant, now make it at home. A weeknight entree that tastes like you cooked all day. When preparing for finicky eaters, reserve one serving of browned chicken breast on a warm platter and serve lemon sauce in a small dish to use as a dipping sauce. Kids love dip! 2. In a gallon-sized zip-lock bag, place flour, pepper and salt. One at a time, place chicken breast in flour bag, zip and shake to evenly coat. 3. Heat 3-4 Tbsp olive oil in non-stick skillet over medium heat. 4. In bowl, beat eggs, parmesan cheese, parsley, and black pepper until batter-like. 5. Dip floured chicken into egg batter and add to hot skillet to brown both sides. Cook for 5 minutes per side or until meat thermometer registers 165 degrees. Remove all chicken to platter and keep warm. 6. Deglaze pan with wine, cooking sherry, and lemon juice. Add butter cubes (they will begin to melt) and let "boil" a few minutes. Ladle over chicken and garnish with lemon wedges.